holidays in Spain and Turkey. A recent feature in ArtMag magazine captures the essence of Anna’s approach to painting and her teaching on our painting holidays in Spain based in the white washed Andalucían village of Frigiliana and our painting holidays in Turkey based on the Turquoise coast fishing town of Kalkan. Join us for winter sunshine in Spain in January and March 2016 to capture the spirit of Andalucía on our painting holiday in Spain. We stay in the hill top village of Frigiliana and set each day to locations to paint en-plein air. Our groups are kept small to ensure one to one tuition time. 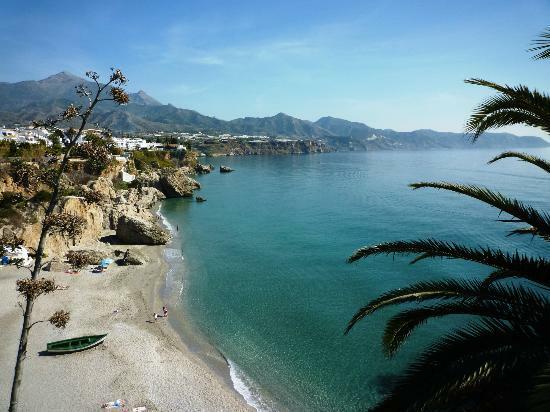 We are spoilt for choice for painting locations in this beautiful part of Andalucía – unspoilt beaches, fishing villages, the stunning gardens of the Botanical Gardens in Malaga or the magnificent Alcazar in Malaga. You also have the opportunity of visiting the Alhambra in Granada on your free day to paint at leisure the vibrant colours of this well-known place. Anna Martin is half Spanish and half English and knows the local area very well having taken small groups to paint in the area for over seven years. She will share with you her love of this unspoilt part of the Mediterranean coast of Spain. Food is a very important part of our painting holidays in Spain and we select our restaurants carefully. As well as fun meals in the evening we visit a local bodega for lunch during the week. We have the chance to paint the views from the bodega and later taste their wonderful wines over a leisurely lunch in the sunshine. We use the Hotel Villa Frigiliana as our base for our Spanish painting holiday. This is set at the edge of the old village and has delightful en-suite rooms all with air conditioning. The terraces around the hotel with views over the village and hills are a great place to unwind at the end of the day with a glass of cool white wine or beer. Don’t hesitate book your sunshine painting holiday now! Or better still ask someone to buy you a gift voucher for Christmas to ensure you have the chance of joining one of our painting holidays in Spain or Turkey in 2016. What better way to start off the New Year!